07:45 - 8:30: We'll pick you up at your hotel and then leave for Ha Long city by shuttle bus while sightseeing the countryside's greenish paddy fields and the peasant farming activities along the road. On the way, you will have a short break for 20 minutes in Hai Duong city where you will have opportunities to experience our hand-made Vietnamese handicraft products such as lacquer wares, paintings, sculptures, embroideries, clothing etc. made by Hai Duong inhabitants & disable children who are most Agent Orange Affected Victims left behind the war. 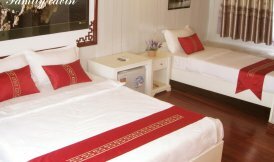 Afterwards we go on the trip to Ha Long city. 12:15: Arrive in Halong Tourist Wharf. 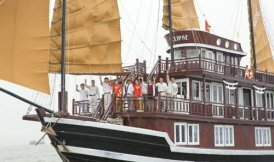 Halong Bay has been recognized by UNESCO as a World Heritage Site since 1994. 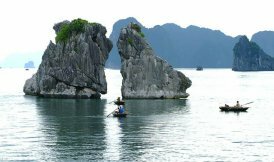 The islands in Ha Long Bay are mainly limestone and schist islands most lying in the two main areas: the southeastern part of Bai Tu Long Bay and southwestern part of Ha Long Bay. They are the result of many times of rising and lowering processes of the continent to form a karst. The process of nearly full erosion and weathering of the karst created the unique Ha Long Bay in the world. In 2000, UNESCO recognized it as the World Heritage for the second time for its geographical and geomorphologic values. 12:30: You will be helped to check in on the Eclipse Sail. Welcome drinks will be served. 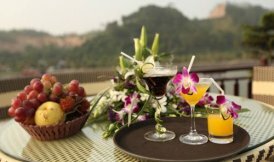 13:00: Lunch is served while cruising through the Bai Tu Long Bay (meaning ‘’Descending Dragon’’). millions years ago, an immense dragon descended to Ha Long Bay, dropping numerous eggs. These eggs hatched forming thousands of rocks and islands. The tail of the dragon extended far to the sea, forming Bach Long Vi (meaning ‘’The Tail of the White Dragon’’). As she returned to heaven, she said good bye to her offspring at the Bai Tu Long Bay (means ‘’The dragon parts the offsprings’’). 15:30: We arrive a very charming & friendly Vong Vieng floating fishing village to experience their daily life on water & start a kayaking around village to get more precious snap-shots in the bay.We anchor here for a time & Our guide will give you some information and interesting facts about this fascinating village and its local community. We are proud of our working partnership with, and support of, this community. 21:00: Leisure time to enjoy a chat around the bar, dancing, karaoke, watch movie or ẹnjoy night fishing… Relax and spend a romantic night on Eclipse Sail. After the breaking dawn, you could refresh yourself by joining us for gymnastics on the fitness room. 08:20: Visit splendid Surprise (Sung Sot) Cave - cave of Surprises – which makes you surprised with its stalactites and stalagmites formed of limestone. It would effect your imagination well. 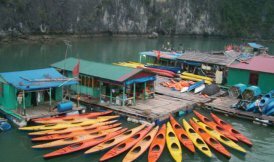 After that you enjoy kayaking around Fishing Villages or Titop island but if you mind kayaking, you can visiting the Titop mountain and climbing up to the top to see the Vung Vieng Fishing Village whole scenery of the bay. After getting down, relaxing on the sandy beach or swimming. 09:30: Back on board. Take time to refresh and relax before checking out. 10:45: An early lunch is served. - All other services not clearly mentioned as include.